The Rolex GMT-Master may be the most famous Rolex pilots watch today, however the bezels on Turn-O-Graph watches were already used by pilots for navigational calculations prior to the launch of the GMT-Master back in 1955. The Datejust Turn-O-Graph is a cool and crazy combination of a dress/sports/tool watch, but once you try one on, you’re kind of sold.. 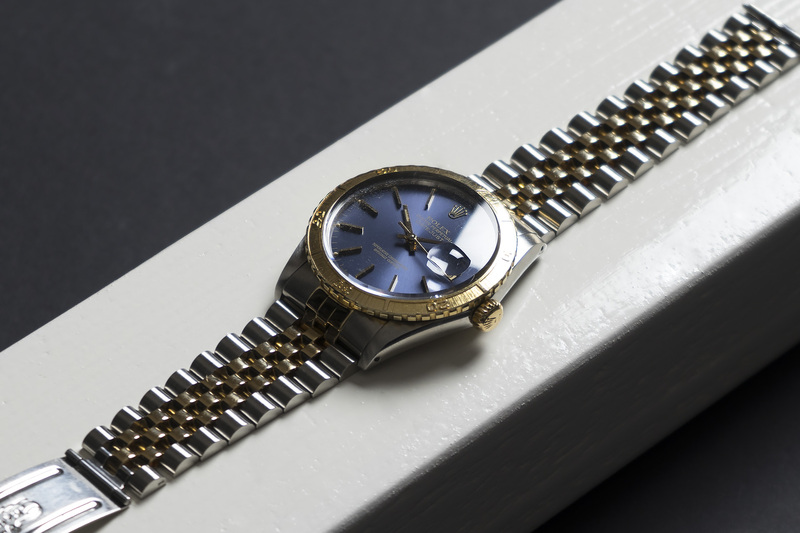 The heavy 18c yellow gold rotatable bezel offers great practically by allowing wearers to time different types of events. Adverts from the early days of the Turn-O-Graph would say the bezel was “a reminder of times past, for phone calls, conferences, timing, parking and countless other ways”. In the late 1950s, the U.S. Air Force’s Thunderbird Aerobatic Squadron equipped their pilots with the Turn-O-Graph watches for navigational calculations. 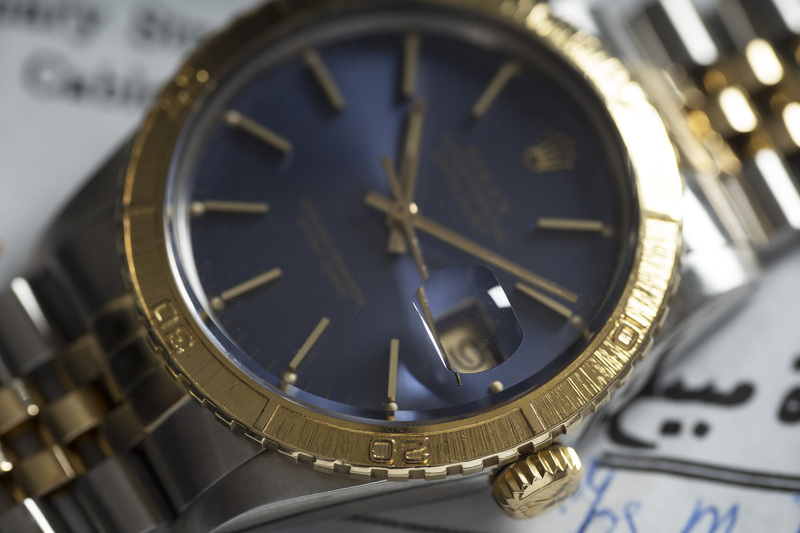 Rolex took full advantage of this and began referring to the Turn-O-Graph watch as the Thunderbird in their North American advertising. 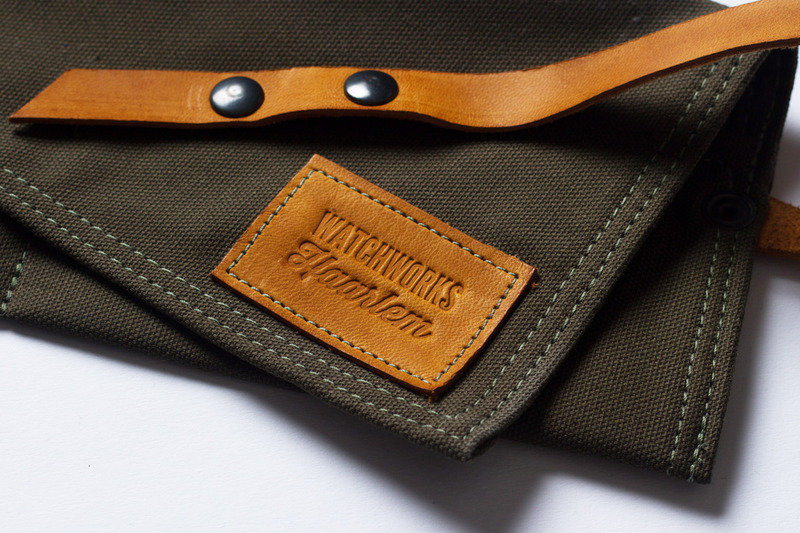 Our ‘Thunderbird’ did not come from the wrist of a pilot, it did adorned the wrist of a Dutch gentleman working in the Middle East however, in Saudi Arabia to be exact. 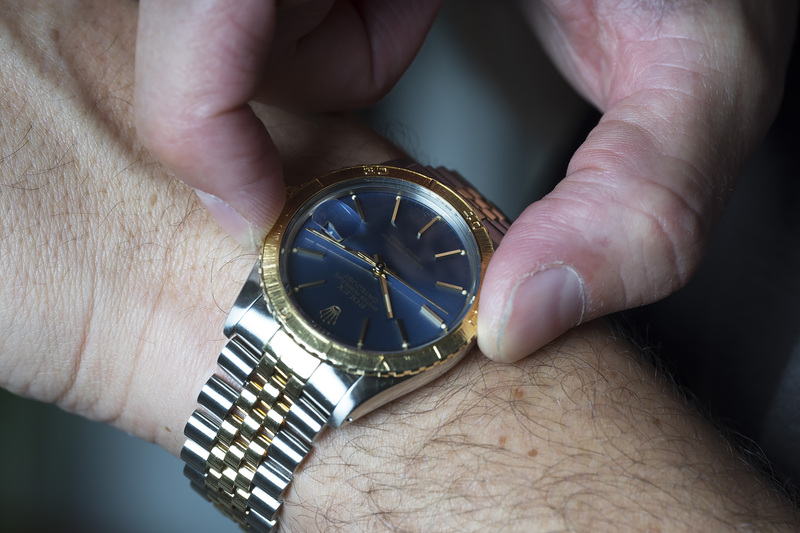 This gentleman bought the watch brand new in 1984 at official Rolex retailer Saddik & Mohamed Attar Co. in Riyadh, following a successful business deal. 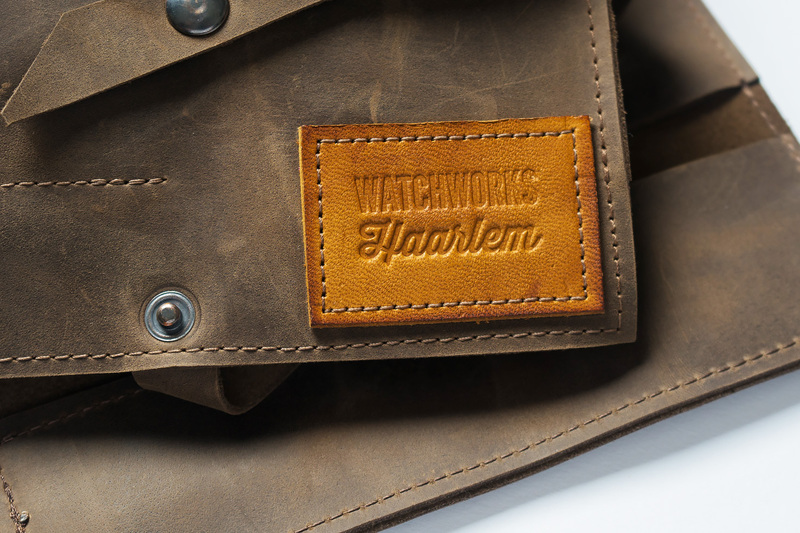 The watch was worn for nearly 30 years before it got retired, luckily it was worn with care. 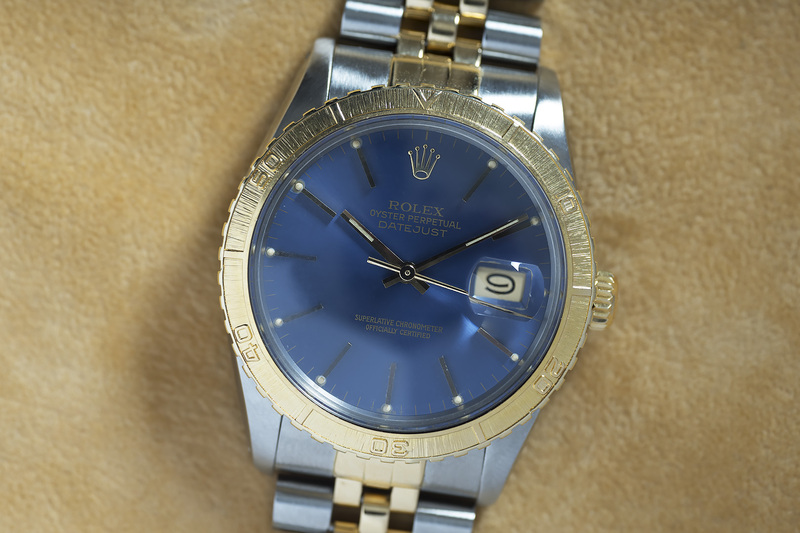 The rare blue dial is still immaculate with no traces of moist or water damage. That blue color by the way is truly amazing – at a certain angle the dial becomes a lighter tone and almost makes the golden text on the dial disappear, very cool! All Tritium dots at the end of the hour-markers are still present and show a beautiful and warm patina, matching to the one in the hands. 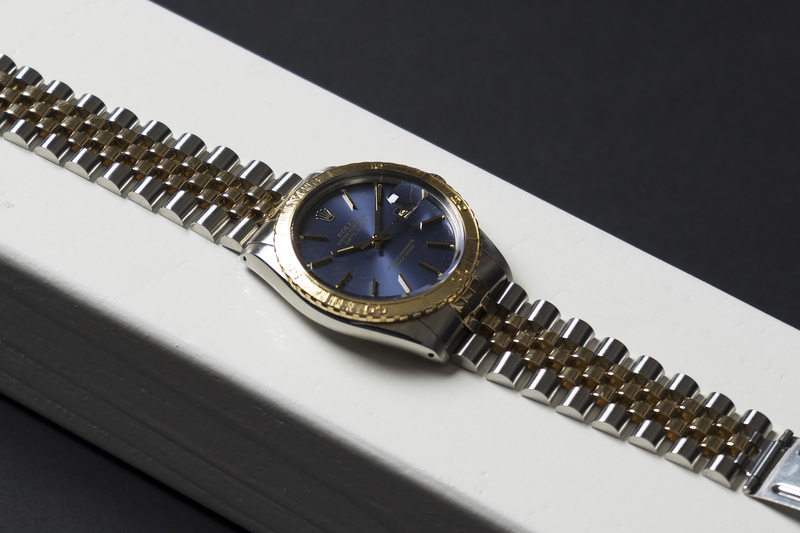 As expected, the gold and steel Jubilee bracelet does show some stretch after 30 years of service, but the case still retains its original shape as does the bezel with its clear numbers and bark like finish between the 10 minute markers. 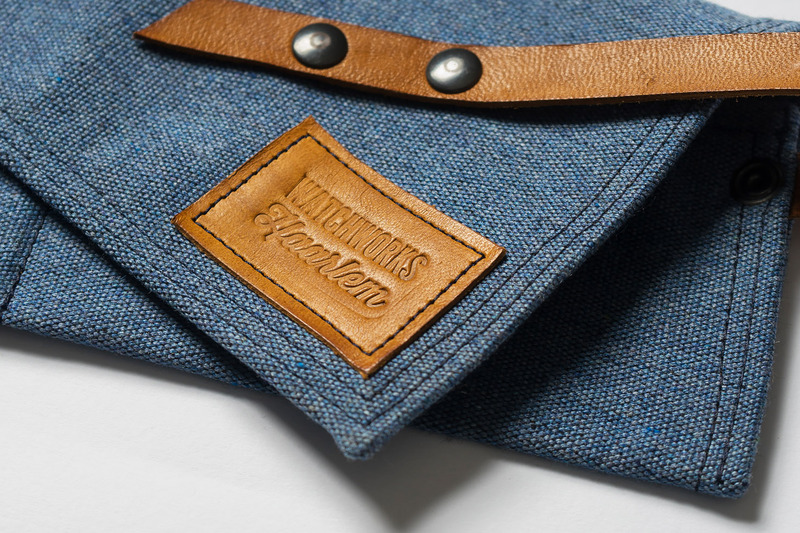 This finish also gives the bezel its excellent readability. This reference 16253 Turn-O-Graph was fully serviced by our watchmakers and will be delivered with a 12 month warranty. If you’re looking for a ‘not your average’ Datejust, this might be the one! 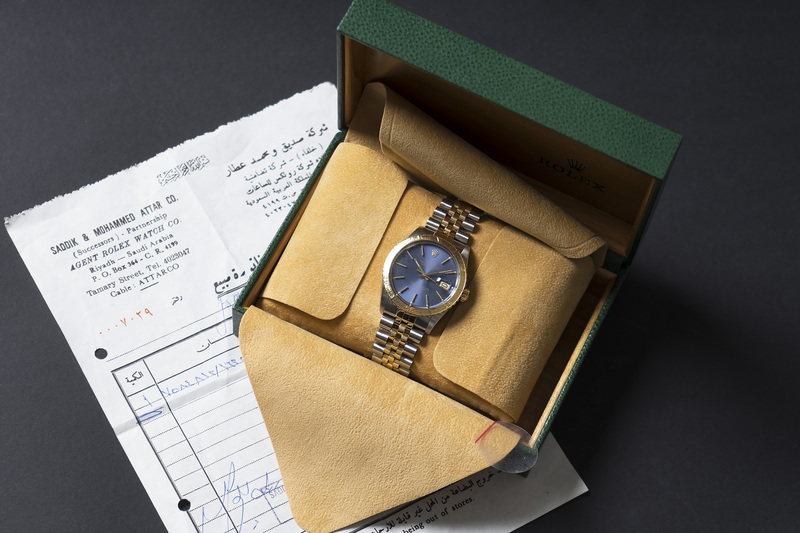 box and papers: Rolex inner and outer box including the original receipt from Saddik & Mohammed Attar Co.